I have been talking a lot about the architecture of VSAN and have written many articles. It seems that somehow some of the more basic topics have not been fully addressed yet like changing a VM’s storage policy. One of our field folks had a question from a customer which was based on this video. The question was how do you change the policy of a single VM? 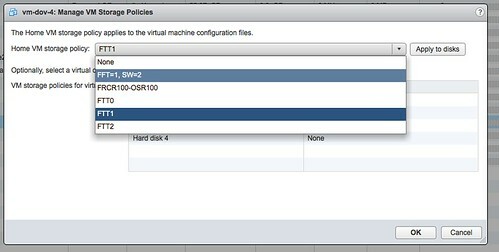 And why would you change the policy for a group of VMs? Lets answer the “group of VMs” question first. You can imagine setting a policy for VMs that perform a specific function, for instance web servers. It could be that after a period of monitoring you notice that these VMs are not performing as expected when data needs to come from spindles. By changing the policy, as demonstrated in the video, you can simply increase the stripe width for all virtual machines. Now the new policy will be applied to the VM. Depending on the selected policy this will take a certain amount of time as new components of your objects may need to be created. Thanks for all these VSAN information. It’s very helpful. I didn’t find information about VSAN configuration capabilities for VMware Stretch/Metro Clusters accross two datacenters (< 10km) with VSAN VLAN distribution. Is it possible to specify on a VSAN rule set that replicas must be on different "Server Groups" (DRS Host Groups/Labels/…) in order to avoid rack/room/campus/site failure? Thanks Duncan, I have my answer. I hope there will be a roadmap for this feature soon.